Anyone for cocktails? 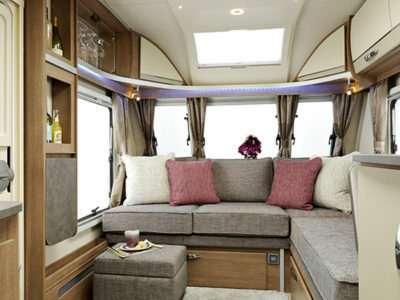 Then bring them on into the new premium caravan brand from Lunar – the Alaria. 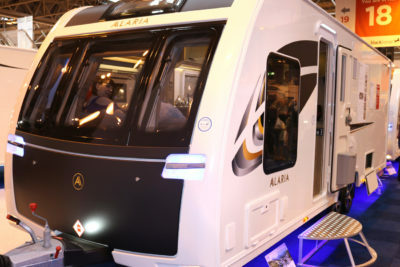 Pronounced Al-R-E-a, Lunar says the name represents “independence, confidence and inquisitiveness” and promises “a new level of caravanning luxury”. A three-model range of four-berth twin-axle models – on an uprated 2000kg chassis with a fully hydraulic E&P self-levelling system and Al-Ko bigfoot steadies. The battery box is also pre-wired for an easy retro-fit of a caravan motor mover. 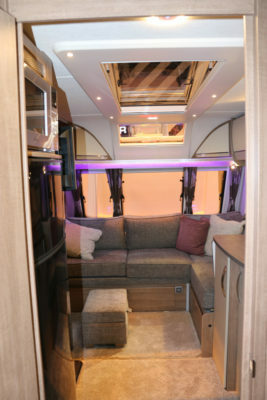 Reviewed here is the RI, featuring a transverse island bed at the back and a full-width washroom over the axles. The Alaria certainly has a distinctive look – with its black front, stylish golden A lettering and blue LED–lit grab handles. And the internal styling is just as striking, where you could imagine serving up a bit of fizz or one of those aforementioned cocktails from the LED-lit drinks cabinet on the drop down “poser” table below. Then sit and relax in the L-shaped settee, with handy footstool, as you watch a movie from the “media hub” opposite – complete with 21in TV/DVD and a pop-up bar of power sockets. The seating does give the tourer a more open-plan feel and the fully integrated sunroof and Maxi Skyview rooflight will certainly let the sun pour into the lounge area. The easy action slide-out bases quickly transform the settee into a generous double bed. At 2.1m x 1.26m. 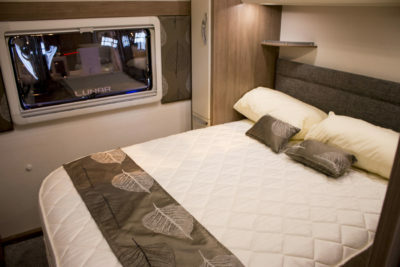 There’s definitely an air of luxury in the Alaria, with its mood lighting in a choice of three colours, the rich cream and silver colours, the deep pile carpet and internal styling. And, of course, there’s plenty of storage throughout the caravan – even in that footstool! In the kitchen there are plenty of cream and Timeo Pine lockers and a Thetford Aspire 2 oven, with extra shelf, grill and four-ring hob – three gas and one electric. There’s also a neat little Dometic extractor hood and light. 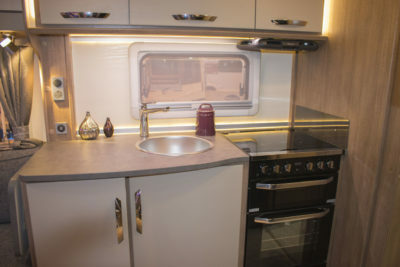 Here you’ll also find plenty of sockets, lights and USB chargers – even the splashbacks are illuminated. There’s plenty of space for food prepping, with a drop-down leaf giving you that little bit extra. The Daewoo microwave sits above a spacious 180-litre Dometic fridge/freezer and the high impact worktops and curved silver handles will make you feel very much at home. Interior styling in the mid-washroom is also very “home-like”, with a designer bowl sink, back-lit mirror above and those Timeo Pine lockers in cream with curved silver handles. 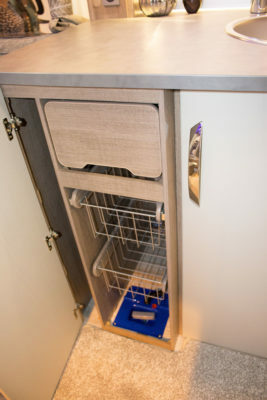 There’s even a small ladder towel rail/radiator and neat swivel mirror to give you the best angle for touching up in the morning or evening, hiding storage shelves behind. The shower is spacious and the tile-effect wall lining is a nice design touch, plus there’s an integral shower light. You’ll also find all the chrome bathroom fittings you’ll need, including clothes hooks. The rear bedroom has a transverse island double bed (1.83m x 1.34m) with narrow storage lockers at either side and small shelves. Plus there’s an option to increase the bed to 1.93m. 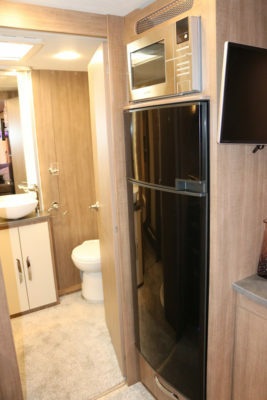 One cupboard hides the Alde wet heating system and there are internal speakers above the bed with TV point for a wall mounted telly, including satellite connection. There are classy design touches to the headboard and window sides. 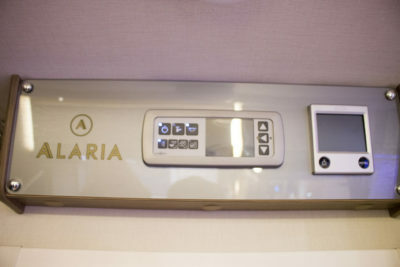 The TS and TI models of the Alaria have an end washroom. 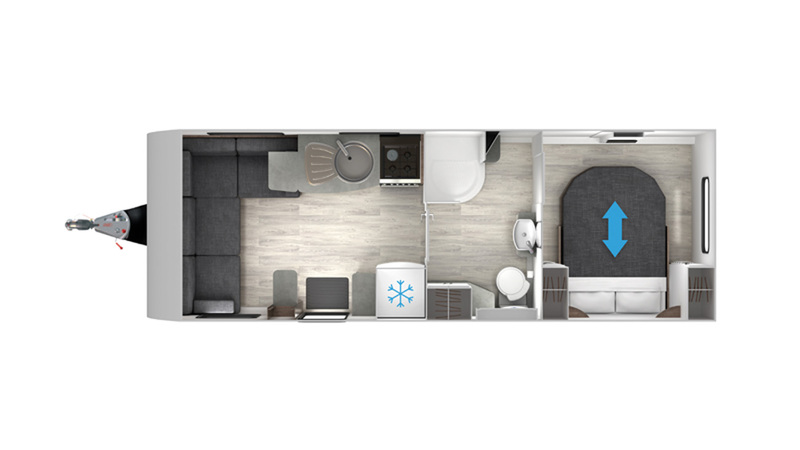 The TS feels slightly more spacious with its twin beds and the TI has a transverse island double. The Alaria comes with plenty of kit as standard, such as a 100W Truma solar panel, plus Al-Ko ATC for extra stability and the fully hydraulic levelling system, which will make pitching up a breeze and easy to line up the wheels to fit the axle wheel locks. 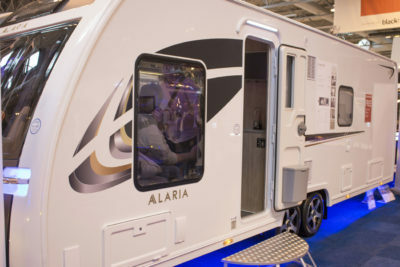 Of course those wheel locks and the ATC anti-snaking, in combination with the Alaria’s standard Phantom tracking device and PIR alarm system should really help to keep insurance premiums down for this luxury caravan. 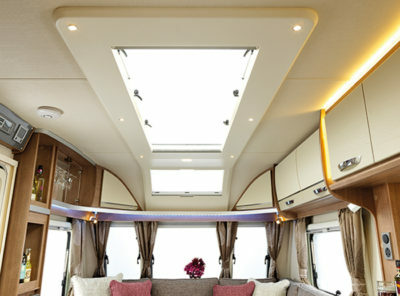 This caravan certainly has it all and brings the interior touches from home into touring. There’s plenty of LED lighting to suit your mood, plus chrome, gloss and alloys – what more do you need?! We’d love to hear what you think about the Alaria. Please add a comment below. Plus: All the mod-cons for relaxing or entertaining! 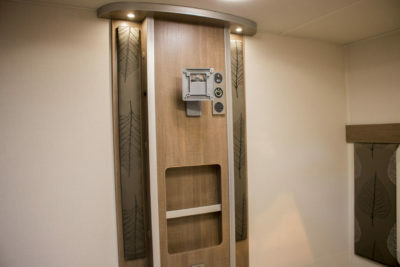 Hydraulic levelling system and mood lighting. 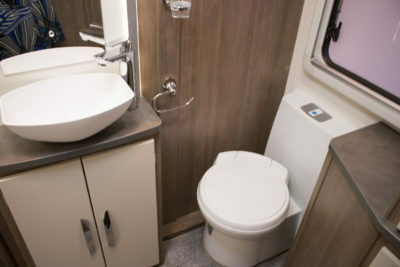 There’s more information on the Alaria range on the Lunar website www.lunarcaravans.com. To find out more about insuring your caravan or our discounts visit our caravan insurance page. 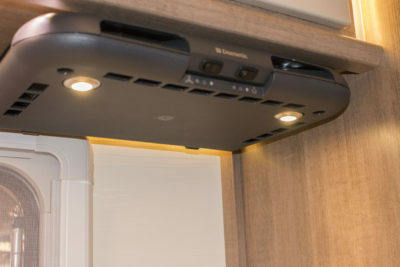 *Caravan insurance cost based on Lunar Alaria RI caravan retailing at £32,499 fitted with hitchlock, Al-Ko secure wheel locks, Al-Ko ATC, PIR alarm and Phantom tracker. Kept on drive at HX4 0BE. Caravanners over 30 years old, claim free for 3 years and a member of a caravanning club. £100 excess. 180 days European cover and up to £75 per day for up to 15 days emergency accommodation cover included. Legal expenses cover, extended European cover and other emergency accommodation expenses cover options are available at extra cost. Quote includes 10% online discount and 10% Insurance Premium Tax and is correct as of 18.10.16. Just bought a 2018 model and love it well built and spec is great and as you say the setting up takes minutes and at a push of a button.